Our last day. In the morning there are a few brief sprinkles, and dark clouds everywhere. I hear two thunderclaps, and Marvin is shaking with nerves. We reluctantly decide to bail on the route. Editors note: the posts in this series are excerpts from Jason’s field notes. Day 5 – 20180731: Our last day. In the morning there are a few brief sprinkles, and dark clouds everywhere. I hear two thunderclaps, and Marvin is shaking with nerves. We reluctantly decide to bail on the route. Nastassja suggests waiting an hour or two to see what the weather will do, but we decide it’s better to move right away if we are to have a prayer of making it to the truck today. We pass the remains of a plane wreck scattered all over the east side of the pass as we descend. We both study the GPS map carefully and pick a route, praying it is free of Cercocarpus (aka. Mountain Mahogany, which forms dense thickets that can be impossible to walk through, even without giant packs). There are some very lovely bristlecone/limber pine groves early on, and we find a huge population of Parmeliopsis ambigua on the north side of one big log. But the ridge we’re following soon turns into Cercocarpus forest, even on the north side. We struggle on both sides, desperately trying to find any way through. It is hard going and very frustrating, not least because by now it appears that the clouds have all but disappeared and we might have been able to finish the route over Montgomery and Border Peaks easily. Longest day, distance-wise. Wander up, following creek part of the way. Find some Claytonia. Top off our water at a snow pack near the top of the slope. It is late enough that we can divert enough flow to fill our bottles relatively quickly. Day 4 – 20180730: Longest day, distance-wise. We wander up, following a creek part of the way. We top off our water at a snow pack near the top of the slope. It is late enough that we can divert enough flow to fill our bottles relatively quickly. The trick seems to be inserting a relatively large rock with a bit of a channel in the upperside into one of the meltwater rivulets. Soon as the water runs clear again, we have a usable spout to fill our bottles under. We fill one bottle over and over, pouring it into all the others, this way only one bottle gets any gravel in it. Off early again, trying to ensure we saw no people today. This early stretch up to White Mountain summit is the only place we are likely to see anyone on the entire trip. We rely on a snow patch visible at top of the ridge to get water. Day 3 – 20180729: Off early again, trying to ensure we saw no people today. This early stretch up to White Mountain summit is the only place we are likely to see anyone on the entire trip. We rely on a snow patch visible at top of the ridge to get water. Its too early for it to melt enough to fill our bottles, so we pack them with ice instead. We rest and eat early lunch there, and while Nastassja fills her bottles with snow melt, I briefly visit the actual summit. The view of the third class pitch coming up is extremely daunting. I can’t imagine how we’re going to be able to do it. But we head on anyway. Day 2 – 200180728: Started uphill early through lovely bristlecone forests, following an old road briefly. Found some wood crusts under a huge old bristlecone, then some Caloplaca atroalba-like thing on pebbles under another big bristlecone at edge of meadow; these crusts were quite similar in community structure to one of our sandstone sites in the northern Mojave. We were worried about water, but springs turned out to be flowing well. There were lots of marmots about, as well as several coyotes near and about the springs – Marvin was having a great day! We rested quite a while at the last spring waiting for the sun to lower before doing the final mile or two to camp. I found some Peltigera didactyla in moss near the spring which I noticed while going to bathe. Day 1 — 20180727: We packed up carefully in the early morning and headed into Cottonwood Basin. All limestone up here. Saw a coyote right at the start, “leading” us to the start of the ridge descent. We found a nice population of what might be Caloplaca parviloba just as we reached the first meadows at the bottom. We found some nice Caloplaca tominii in the main meadow, which seems to be recovering nicely, with hardly any sign of the trails or grazing which I remember from 20 years ago. We decided this would be a good place to periodically monitor soil crust communities with a drone. We drove both vehicles to the Trail Canyon trailhead and camped near there in a lovely spot in a Pinyon-Juniper woodland. Very intimidating thunderstorms were looming all along the White Mountains and ranges to the east. We decided to delay for a day in Trail Canyon, and stay in Cottonwood Basin the following day. 20180725: We drove both vehicles to the Trail Canyon trailhead and camped near there in a lovely spot in a Pinyon-Juniper woodland. Very intimidating thunderstorms were looming all along the White Mountains and ranges to the east. We decided to delay for a day in Trail Canyon, and stay in Cottonwood Basin the following day. The White Mountains of California / Nevada are the little known younger sister of the High Sierras. The White Mountains of California / Nevada are the little known cousin of the High Sierras. Most folks visiting the funky town of Bishop, California are heading up into Yosemite or Sequoia Kings Canyon National Park. Some might see the sign on the east side of the US-395 for the “Ancient Bristlecone Forest” which leads you up into the White Mountains. Some might even go up there to see these 5,000 year old magnificent trees. But beyond a couple groves, this mountain range is pretty much overlooked by most folks. 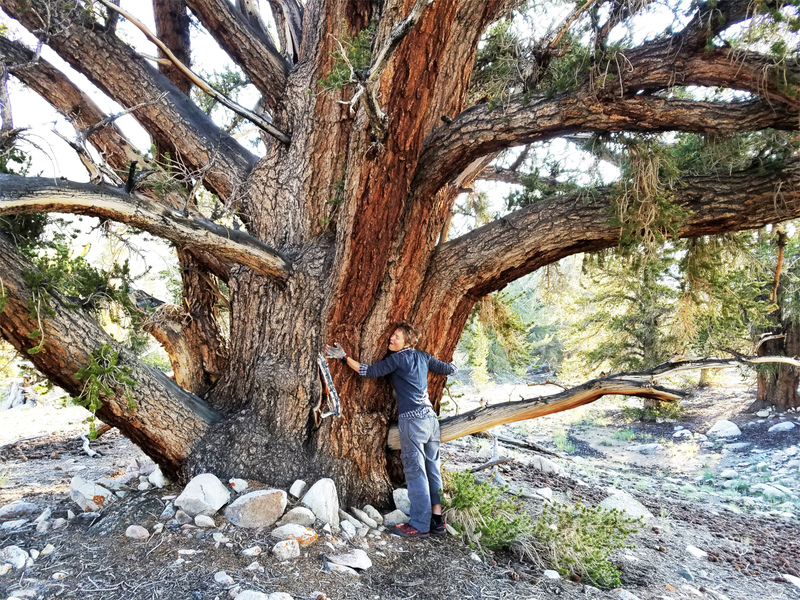 What are the common alpine lichens found in the High Sierras of California? This handy six page guide just might answer that question. Jason and I made it for naturalists, alpine enthusiasts, and citizen scientists, with the hope that it will be helpful in field identification of common alpine lichen species or species groups. Rarity is indicated, so if anyone observes any of these rare lichens on a summit in the High Sierras, we encourage you to take a photo, a GPS location with elevation, and email us. 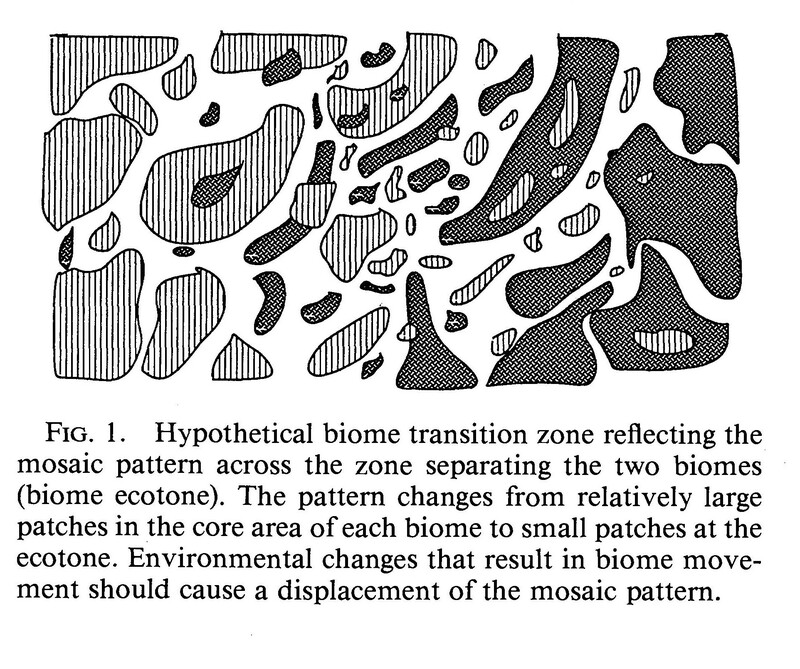 An ecotone is a transition zone between two ecological systems. Ecotones can range in size: in some places ecotones are wide (e.g. forest – grassland ecotones), in other places they are quite narrow (e.g. riparian – arid shrub steppe). In the ecotone, habitats from each ecosystem form a mixed patchy mosaic, often with species assemblages not found elsewhere, and interesting juxtapositions. From “Ecotone Hierarchies” by James R. Gosz, in Ecological Applications, Vol. 3, No. 3. (Aug., 1993). Last April, Jason and I surveyed lichens in the northern Mojave. It’s the second field season of a three year study involving lichen biodiversity along the ecotone of the Great Basin and Mojave Deserts in Southern Nevada. Notes on lichens, living, and a bit more…. Lichens are far more than the sum of their parts, they are systems, and this requires a different way of approaching science: a systems based philosophy of life and living. Its in these yet undefined spaces where the muses of the natural sciences live and thrive, where the creative processes of scientific inquiry and the pursuit of understanding breathe with life. This is a blog of those musings, field adventures, and sometimes, some dry taxonomic notes.